Even though Bricco Restaurant opened in downtown Akron in 2003, my first visit ever made to this local chain was at their Cleveland location back in 2008, located across from Playhouse Square. 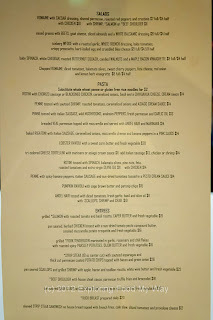 Since then, I've eaten numerous times at Cafe Bricco and Pub Bricco, but never managed in the nine years since the original opened to eat at the Akron location. Last Thursday I decided to complete the cycle -- sometimes it takes a while to go full circle. The original Bricco Restaurant was located in downtown Akron at 1 West Exchange Street, Akron, OH 44308 and can be reached at 330-475-1600. Valet parking was available, but I opted to park on the street about a quarter mile down Exchange Street and walk to the restaurant. Since it was after 6 PM, there was no cost to park on the street. 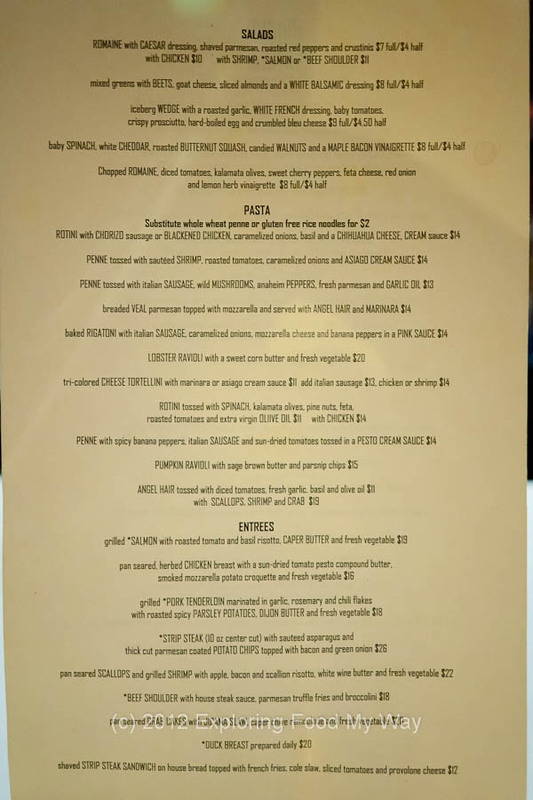 If you examine the menu a little more closely, you'll catch one of my pet peeves of menu writing: capitalization of the key words in the descriptions. This annoys me on two levels. First, it breaks up the reading flow by making the eye stop on certain words (which I suppose is the point). 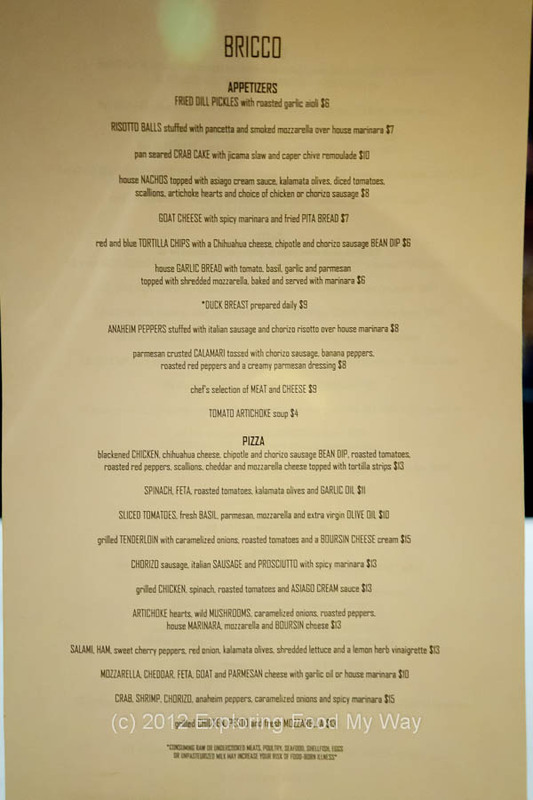 But, it also strikes me as a bit foolhardy to think that you consider your customers not capable of deciphering your menu, so they have to pre-digest it for you. While the bread was fresh and tasty, it wasn't exceptional. The crust had a nice chew to it, but the crumb wasn't particularly remarkable. 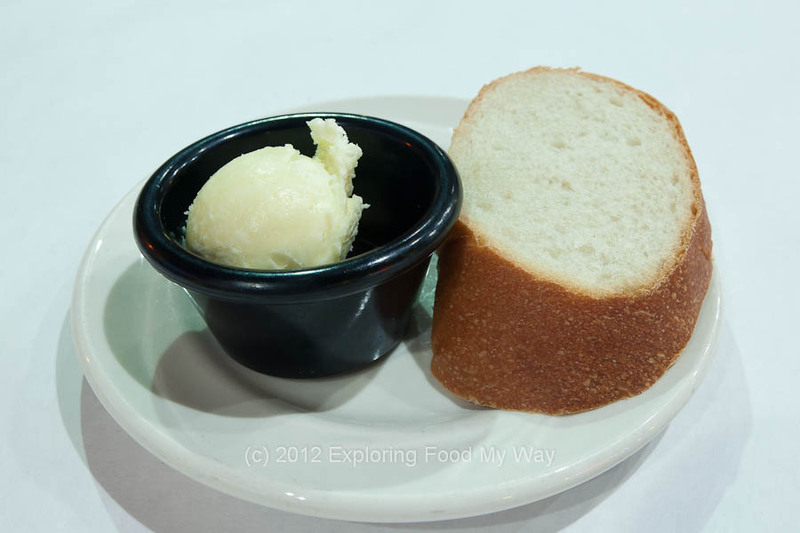 The butter had been whipped and sweetened slightly and spread easily on the bread. While more classically known as arancini, tonight's risotto balls were filled with a mixture of smoked mozzarella and pancetta. Crispy on the outside and creamy on the inside, these were quite good and I found myself enjoying the contrast of the fattiness of the smoked cheese against the acidity of the tomato sauce. The only criticism I could really levy against this dish was that the pancetta was a bit few and far between. 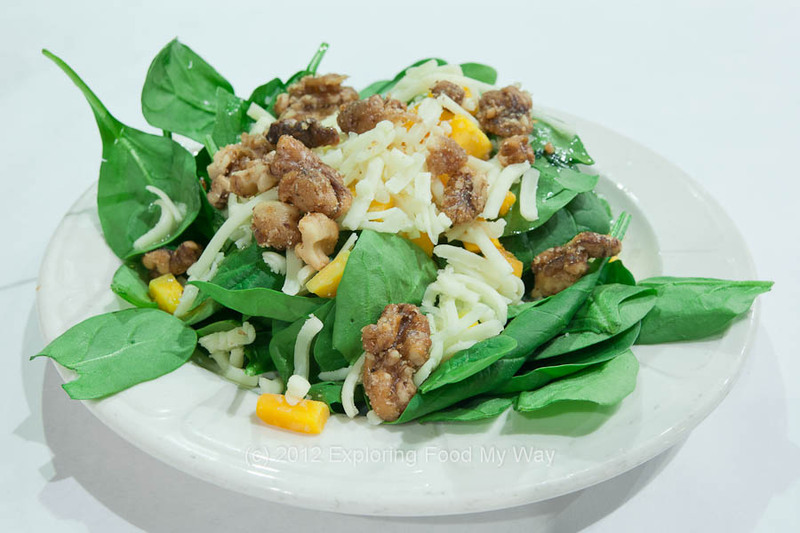 I am a firm believer that a properly "dressed" salad is one in which all of the leaves get a thin, even coating of the dressing. This is why whenever I dine in a restaurant where I think this won't be the case, I ask for the dressing on the side. At restaurants of Bricco's caliber, however, I trust that the individual running the garde manger station (i.e., "cold line") will properly dress the salad leaves. If you take a closer look at the picture above, you'll notice the same thing I did -- namely that the baby spinach leaves were dressed very unevenly. In fact, most of the leaves toward the front and right side weren't even dressed at all. Not a good start. I tasted individual components of the dish before building a forkful with each flavor and texture. While the slight sweetness from the maple bacon vinaigrette came through, none of the smoke or porky flavor from the bacon was evident in my mouthful. The white cheddar was a nice touch, but the overwhelming sweetness from the candied walnuts dominated the other flavors. The roasted squash didn't really bring a lot of flavor to the party, but it did add a surprising crunch that one normally wouldn't associated with a vegetable that had been roasted. Overall, I didn't particularly enjoy this course of my meal. Served with a apple, bacon, and bacon risotto, the plate also contained tender haricot verts and a buerre blanc. The plating of the dish was a bit one-sided (as you can see from the picture above) and struck me as a tad odd. 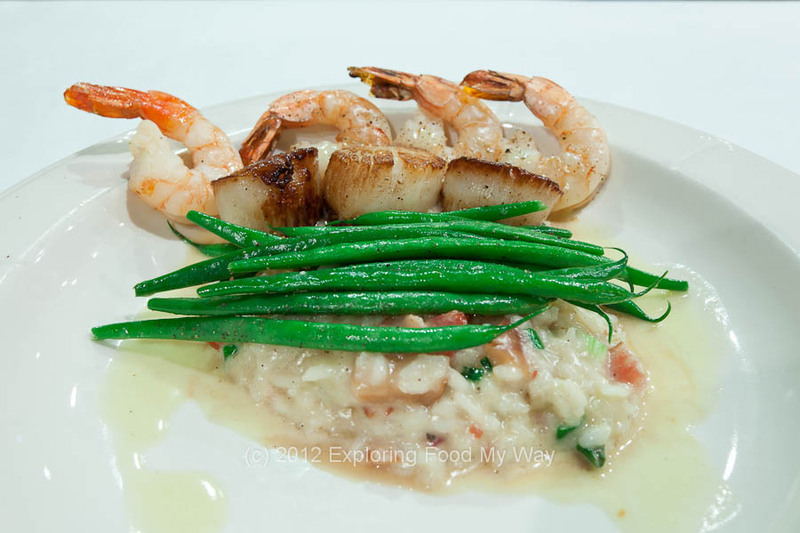 I would have thought that distributing the scallops and shrimp around the risotto might have been a better choice. As for flavors, I started with the scallops. As I sliced into the beautifully caramelized exterior of the first scallop, I was rewarded with a lovely translucent interior. The scallops were perfectly seasoned and cooked. The grilled shrimp were also excellently seasoned, but had just a hint of chewiness to them, indicating that they were overcooked just slightly. The haricot verts were seasoned well and had both a softness and crispness to them. The risotto, this time around in its original more liquid form, was creamy, soft, and delicious. There was one bite where it came across as too salty, but it must have been a bite where there was a lot of bacon on the fork as I couldn't replicate it. The buerre blanc, while pairing nicely with the seafood, didn't really add that much to the rest of the dish. 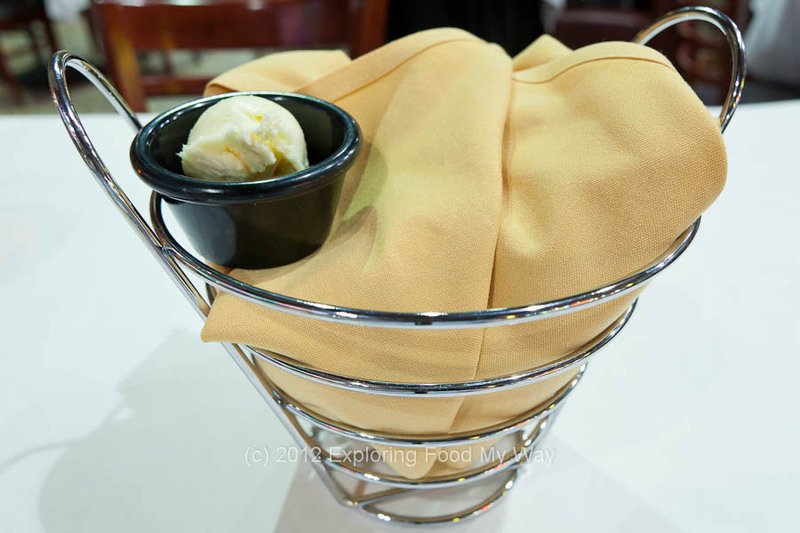 When my server mentioned dessert to me, I was a bit wary about having anything too heavy or rich. Even though I had asked my server to box up half of my appetizer and entree, I was still feeling pretty full. When I indicated that I'd at least be willing to look at the dessert menu, my server proceeded to rattle off a list of tired and predictable stand-ins from decades ago: two flavors of NY-style cheesecake, creme brulee, and the classic, warm chocolate lava cake. All of these were made in-house. The two frozen items, a peach-mange gelato and a sorbet (whose flavor I cannot remember now) were made by an outside local company, Country Parlour. Figuring that a nice gelato and a cup of decaf might make an enjoyable way to end the meal, I decided on taking that route. While waiting for my dessert to arrive, I pulled up the website for Country Parlour and then, curious to see what other flavors of gelato they had, I navigated to the page containing their flavors. I discovered two VERY interesting things. First, their webpage of flavors didn't list gelato of any kind ... Italian ice, yes, gelato, no. 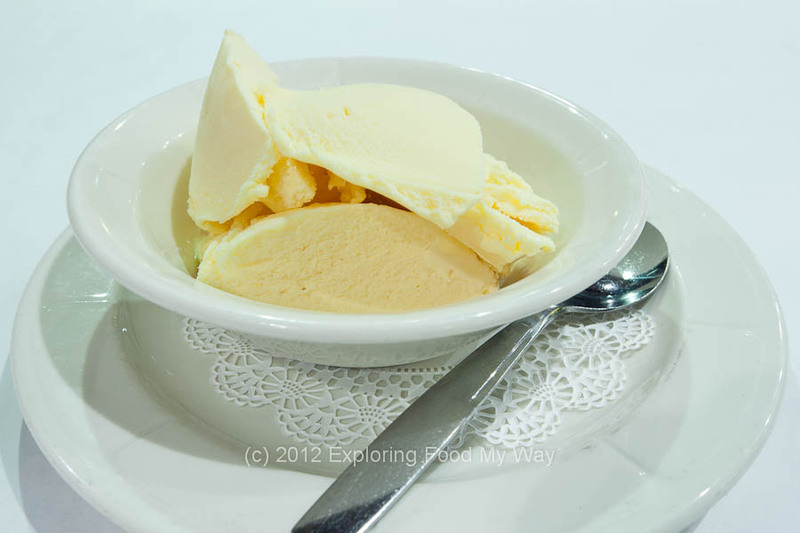 The second was that regardless of the type of frozen dessert, none of them were of the peach-mango variety. Perhaps Bricco was having Country Parlour make something special that only they served. While I was impressed with the quantity of the serving, visually, this looked unimpressive. I was expecting several nicely rounded balls of gelato, instead I received a bowl full of frozen wedges. One of the hallmarks of fruit-based gelati is their intensity of flavor. The peach flavor was evident upon taking my first bite, but the intensity wasn't there. Because peach and mango share similar flavor profiles, it is easy to see why pairing them would be a good idea. The mango was imperceptible at the start of the mouthful, and was only barely there at the finish, due to the slight acidic flavor of the mango. In the end, it was still a nice way to end a meal, if not fully meeting my expectations. When the final check came, I wasn't surprised that my total, with tax, came to a little bit north of $41. While I would say this was on the moderately expensive side of the dining options available, there were enough positive points regarding tonight's dinner that I would still recommend them. 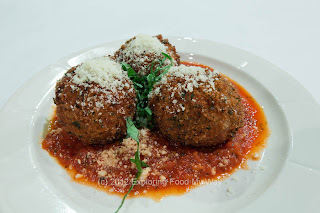 Other than the arancini I received for my appetizer course, the one standout criticism I would say concerned me the most was attention to the fine details -- salads that aren't completely dressed and plates that look unbalanced are unimpressive at the level which Bricco seeks to reside. 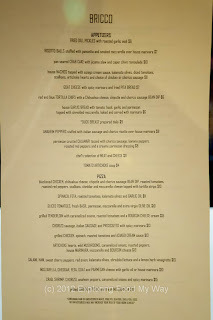 In the end, I think Bricco adds a nice, upscale Italian food restaurant to the downtown Akron dining scene, but it would do them wise to pay attention to every plate that comes out of the kitchen. I would kill for one of those meatballs right now! YUM. @Theresa: Meatballs? Those weren't meatballs, but arancini (fried risotto balls). That being said, they were delicious and I'd go back for those alone.